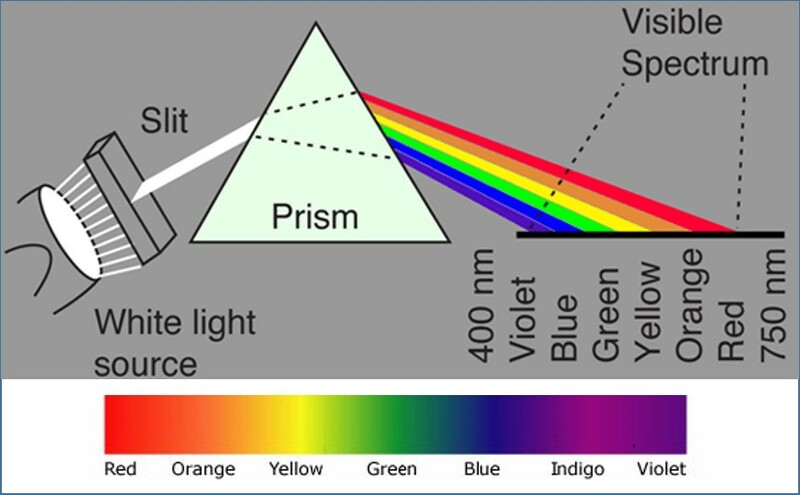 When white light from a tungsten filament is passed through a prism, the light is dispersed into its component colours, as illustrated in Figure 1. The band of different colours is called a continuous spectrum. In the experiment shown in Figure 1, the resultant colour and wavelength limits are violet (about 400 nm) and red (about 700 nm). Since the spectrum is produced by the emission of light from the tungsten filament lamp, it is called an emission spectrum. A discharge tube is a transparent tube containing a gas at low pressure. When a high potential difference is applied across two electrodes in the tube, light is emitted. Examination of the light with a diffraction grating shows that the emitted spectrum is no longer continuous, but consists of a number of bright lines as shown in Figure 2. Such a spectrum is called a line spectrum. It consists of a number of separate colours, with each colour being seen as the image of the slit from the source. The wavelength corresponding to the lines of the spectrum are characteristics of the gas, which is in the discharge tube. Electrons in an atom can have only certain specific energies. These energies are called electron energy levels. They can be represented as a series of lines against vertical energy, as illustrated in Figure 3. For example, the electron in the hydrogen atom can have any of these energy values, but cannot have energies between them. Normally, electrons occupy the lowest energy levels available. Under these conditions, the atom and its electrons are said to be in the ground state. If the electron absorbs energy, it may be promoted to a higher energy level. 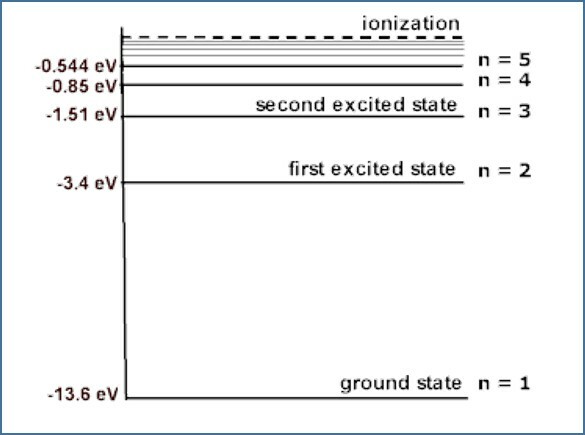 Under these conditions, the atom is described as being in an excited state. An excited atom is unstable. After a short time, the excited electron will return to a lower energy level. To achieve this transition, the electron loses energy by emitting a photon of electromagnetic radiation. This movement of an electron between energy levels is called an electron transition. Downward transition from higher energy levels to lower energy levels results in the emission of photons. The atom can be raised to an excited state by the absorption of a photon. E1 – Energy of the higher level. E2 – Energy of the lower level. h – Plank constant (6.63 x 10-34 J s). The light emitted by atoms in a solid, a liquid or a gas at high pressure produces a continuous spectrum. This happens because of the proximity of the atoms to each other. Interaction between the atoms results in a broadening of the electron of the electron energy levels. Subsequently, transitions of a wide range of magnitudes of energy are possible, and light of a broad spread of wavelengths may be emitted. This is seen as a continuous spectrum. When white light passes through a low-pressure gas and the spectrum of the white light is then analysed, it is found that light of certain wavelengths are missing. In those places, dark lines are formed. This type of spectrum is called an absorption spectrum. As the white light passes through the gas, some electrons absorb energy and make transitions to higher energy levels. The wavelengths of the light they absorb correspond exactly to the energies needed to make the particular upward transitions. When these electrons return to lower levels, the photons are emitted in all directions, rather than the original direction of the white light. Thus, some wavelengths appear to be missing. It follows that the wavelengths missing from an absorption spectrum are those present in the emission spectrum of the same element. This is illustrated in the following figure. If a spectrum is produced by the emission of light from a light source (tungsten filament lamp), it is called an emission spectrum. Electrons in an atom can have only certain specific energies. These energies are called electron energy levels. The light emitted by atoms in a solid, a liquid or a gas at high pressure produces a continuous spectrum. When white light passes through a low-pressure gas, light of certain wavelengths will be lost. In those places, dark lines are formed. This type of spectrum is called an absorption spectrum.